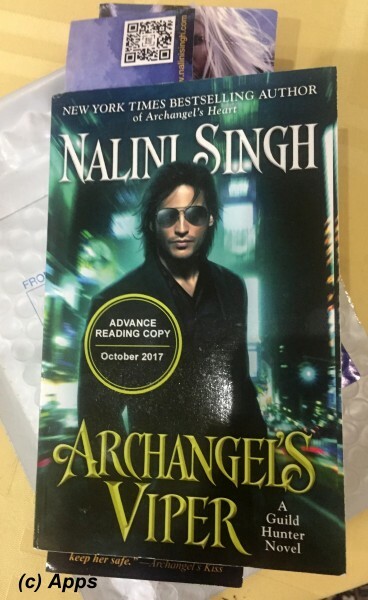 Archangel's Viper is the tenth book in the Guild Hunter series by Nalini Singh released on September 26 2017. The plot revolves around Venom - one of the powerful Vampire in Raphael's Seven - and Holly Chang aka Sorrow - girl broken by Archangel Uram in his madness. Earlier this year when Nalini Singh had an online contest for receiving an early copy of the book, I participated and to my surprise I won one of her copy. Incredible and very thrilling. So, here is my review of the advanced reading copy just three days after it is officially released. Note: Since I am reviewing an uncorrected proof copy there may be errors that I see but might have been corrected in the actual book that released yesterday. Brief Intro about the Series in general: The stories in this series are set in a world where it is ruled by Archangels with Vampires, Angels and Humans with extra-ordinary powers as their team serving them. One of the powerful Archangels is Archangel Raphael who rules North America from The Tower in Manhattan, New York along-side his consort – Elena and his Seven. There are nine other Archangels who rule the different regions of the world. They are immortals who have lived thousands and thousands of centuries and rule the world filled with Angels, Vampires, Guild Hunters and Humans The plots in the series primarily revolve around Archangel Raphael, his consort and his Seven. Holly Chang was a human but forcefully converted to something else – neither fully human nor fully vampire - by the insane archangel, Uram. She calls herself now as Sorrow. Under the protection and direction of The Tower, she grows into an able soldier for The Tower prowling the undergrounds of the city making friends with the darker side of the city to unearth much needed secrets for the Tower. And now someone has put a bounty on her. Who would want Holly kidnapped? And how did her secrets get out? Venom – the youngest of Raphael’s Seven and a Vampire – assigns himself as her personal bodyguard until they find out answers to these questions, for Holly was always his to train. However Holly is just waking up and her powers are rising. No one knows to what extent they can go. Will Venom be safe from Holly? What will Holly do when the powers finally rise? How will this bloodlust end for them both? What follows is a very intricate web of moves that keeps the reader glued till the end. We get first glimpse of Holly Chang in Angels’ Blood – the very first book in the series – when she gets taken by insane Archangel Uram and had used her as a pet toy. (My review of this book here). The only survivor of that rampage, she had been under the protection and close watch of Tower ever since, not just because she was a survivor, but also because of not knowing what poison had Uram injected to her and how that would change her. We see her character evolve a bit more in the fourth book in the series Archangel’s Blade (My review of the book here) which is when she is placed under direct protection of Dmitri. Focusing the plot entirely on Holly giving little sight to Venom - at least in the beginning - I thought would be a wrong recipe. But as we read through the book, when the dots start connecting, I can't appreciate enough on the brilliant move by Nalini - for, Snakes are supposed to show surprise moves. Not being completely human nor a full vampire, Holly becomes a perfect complement for Venom – both being something other. And just not in that but in their powers too. The rise in her powers scares Holly the most, but doesn’t seem to scathe Venom a bit. Venom's brutal strength is seen in every aspect but it is not lost on the reader how gentle he is shown by Nalini at instances giving him the human touch. Those little bits that Nalini adds makes her characters more likeable and readable. It was a pleasant surprise to see more of Janvier and Ashwini Taj in this book. They have become fast favorites to me over the period of time the series progressed. For once it was interesting to see a plot bringing the three of the most powerful of the Seven together - Dmitri, Illium and Viper - although the plot centered on Viper. Not just mentioning them off-hand but giving the characters substantial role. They gave the true meaning to being brothers even though not born to same parents or at the same era. And with very entertaining conversations, they charmed me further. Nalini has smartly weaved into scenes from the previous books and connecting them with this plot giving it a feel that one is living the lives of these character, like following each day of their lives. Connecting them that way added a smooth flow through and through the series. For instance, there is distinct mention of Elena and Raphael being away from New York and attending a Cadre meeting in Lumia - which is the essential plot of the previous book Archangel's Heart (My review of the book is here). We also see the continued conversations around Illium and Aodhan's spat that occurs in the previous book. Like any other book in the series she has again left this plot open-ended for the reader to know there would be a follow-up in the near future. However what I feel is that the follow-up could be two books again one following the line where Archangel's Heart ends and one where this book ends or could be an amalgamation of both. One has to wait and see what Nalini eventually produces. Another thrilling adventure in the world of archangels, angels. Vampires, guildhunters and humans that keeps you gripping till the end. a. Through Dmitri, Holly is placed under Janvier – a 245 year old Vampire – and Ashwini Taj – a Guild Hunter turned Vampire, wife of Janvier, who take the role of her bosses very seriously in training her and making her a better “other”. i. She develops the uncanny ability to mesmerize her prey and also has a very poisonous bite – something Venom also has but much much more potent than Holly. ii. Her skin starts fading in and out without her knowledge at times whenever there is a tingling sensation on her skin – like being invisible to the people around. iii. She develops an ability to break bones without touching the person, just by thought. iv. She develops a rumbling sound almost feral and animal-like. v. She develops the boneless way to fall and rise in combat just like Venom. 2) Grammatical / Factual / Location / Historical / Character Errors: Perhaps these are corrected in the official release, but I am documenting them none the less. a. On Pg. 86, para 3, second line: It should read “They had wanted to give…” rather than “giving”. b. On Pg. 91, para 2, second to last line: The whole sentence in grammatically incorrect. c. On Pg. 120, second line: It should be “here” instead of “her”. d. On Pg. 216, para 4, "tiny" is misspelled as "tony" in the line "He floored the pedal…." 3) Small Sub-Plots: Like any author Nalini also has sub-plots and minor characters in her books. Of course not every character evolves or has their own story, but there are some that intrigue me and wonder if they would grow into plots of their own. Some sub-plots have been carried over from previous books or relate to the plots completed. a. Marcia Blue – who was first introduced in Archangel’s Legion (My review of this book here) – a 100 year old vampire with whom Elena has one of her businesses, is shown to be interested in another vampire named Jonas – Elena’s financial manager - in Archangel's Heart (My review of the book here). Waiting to see if Nalini would evolve these characters in future books. b. Illium - the blue-winged angel and one of Raphael's Seven - is growing fast in his power due to The Cascade and no one knows what it would mean - for good or for worse. Although he has no more power surges but he often gets every vein and nerve in his body glowing. More of Illium's past is revealed in this plot along with the clear indication that one day he would become an archangel - courtesy of effects of The Cascade - and that Aodhan would follow as his second. I would love to read that plot sooner than later. c. There is still mystery surrounding what happened to Aodhan. We got to see more of Aodhan’s past, about his family and his near-death incident in the previous book Archangel's Heart. I was hoping Nalini had Aodhan as her central topic in the next book. Instead it had become about Venom as we see. So hoping that her next one would be about Aodhan or may be it would be about Illium first and then have Aodhan. Either way I am so looking forward to read about them. d. The fight between Illium and Aodhan is shown as continuing although not so much as a plot but more as both being silently angry at each other. Of course we still see Aodhan being in Lumia and Illium in New York per this plot. Will have to wait for Aodhan to come back to see how they patch up. And if Nalini would spin them as brothers or make them a pair. e. Lijuan's Forbidden City was gift from one of the ancient architects, Suyin. However it has been recorded in history that she had committed suicide in a sad and mysterious manner. Yet, Andromeda finds her in Lijuan's citadel, frequently coming out of her sleep - which is what she had chosen - to see if her aunt had survived or evolved or been destroyed, for her aunt is none other than Lijuan. Will there be a story for Suyin herself in future? I wonder. f. Michaela - Archangel of Central Europe - could be pregnant. Could Dahariel indeed have been capable of it? Or is Michaela playing out a different identity to hide her real evolving due to The Cascade? Or whatever Uram - the Archangel of Russia who had gone mad and eventually was killed by Raphael - had done to her had left something of his in her that is surfacing now? We have to wait and see as the series proceeds. g. Can an angel turn to god? Is that what happened to Lijaun - Archangel of China. h. I am curious to see how Nalini Singh will evolve Mahiya Geet - wife of Jason - since she left with an open-ended statement that nobody knows how much powers are enhanced. My review of the book showing the story of Mahiya can be read here. a. Archangel Michaela - reigning Central Europe - has developed an ability to leave behind static pieces of her power even though she is oceans away. b. Archangel Elijah - reigning South America - developed ability to control cats and birds of prey. 5) When two Archangels are part of the same territory it is fun to read how they deal with it. In this case, the territory of Persia is split because the reigning Archangel Favashi has less power and influence than Archangel Alexander who had recently risen – plot told in the book Archangel’s Engima (My review of the book is here). Can’t wait to read how the fate of these two characters will turn out. 6) Cadre - For an Archangel to be part of Cadre means being an absolute ruler over a portion of the globe. They rule their territories and those beings within them with iron control. The only being strong enough to stop an archangel is another archangel, and when they clash, the fate of mankind hang in the balance. 7) Raphael goes into The Quiet - a state of mind that he has only gone once before that pushes him to do the justice without reason, meaning he may be right in passing the judgment but he has less tolerance to reason on the method or think about consequences. 8) I am also curious to see what are the new powers all the Archangels acquiring as a result of the Ancient rising from here sleep.